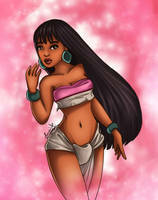 Chel from Road to El Dorado. I've seen that movie 50 million times and this is the first time I've ever heard someone even mention it. Thank you. This made me realize that her and Tulio would make a good couple Halloween costume. Maybe you and your gf, Kawacy? XD I loved that movie as a kid. OH Heaven! Soooo well done! Awesome work! haha fits quite right xD .. aaah damn eldorado!! That is so hot! and i have to say! nice work! I loved tht movie! omg awesome job! ROAD TO EL DORADO!!!! I LUV THAT MOVIE!!!! she is amazing!! great job!! I remember seeing this movie in theaters in 2000! I loved her! She was so spunky and sassy, I'm glad she ended up as one of the boy's girlfriend, although I would have preferred Miguel since he hinted at having a thing for her. I love Chel. Hot damn this is great! I knew who this was automatically without even looking at the title. I love this so much. You sure did this character justice! This is really beautiful! The composition, the colors, her eyes! It's all awesome. gold...is girl's very best friend!!! most wonderful made of her...yah very! I think this is what the designers had in mind when coming up with her character. aw. my. god. she's gorgeous.